Being an Italian family it made perfect sense to the Bottega’s to make wine in South Africa using famous Italian varietals. We’ve already looked at, and vicariously enjoyed, their French influenced range of wines, follow the link if you missed it, so now it’s the turn of some of the most expressive wines I’ve tasted in a long time. Italy boasts more indigenous grape varieties than any other country and yet we rarely see them being produced successfully outside of Italy. They have a real sense of place and so being able to produce high quality wines with iconic Italian grapes is truly a feat to be applauded. We started our Italian Odyssey with the grape best known for producing Barolo and Barbaresco, Nebbiolo. Idiom Nebbiolo 2010 is as typically varietally correct as any text book will tell you. Licorice, nutmeg and tar first fill the nose but these are quickly followed by lashings of juicy sweet and sour black cherries and roasted strawberries. The texture is firm and confident in the mouth and the rose petal delicacy of the finish really highlights the skill that has gone in to creating such a mutli-faceted wine. Staying in Piedmont we next tasted the grape that has made the towns of Asti and Alba famous, Barbera. Chianti is arguable the most recognised red wine of Italy and so the Bottega family couldn’t really make iconic Italian varietals without including Sangiovese, the grape much loved across Tuscany, including Brunello di Montalcino. Idiom Sangiovese 2010 is once again absolutely typical of the variety except with a little more warmth and playfulness. We have the expected strawberry, cherry and plum fruit, leathery earthiness redolent of riding horseback through a forest after the rain, and the tannic, but not too tannic, structure. But what I feel really gives this wine the edge is the fresh floral, herby finish that lifts the palate at the end. It is an absolute delight. Our final wine on this exploration and admiration of Italy is a grape that in southern Italy is called Primitivo, but is possibly better known for being what the Californians call Zinfandel. And what a wine to end with. Idiom Zinfandel 2010 is exotic and explosive in the glass. It bursts with heady fragrances of sage, rosemary, dill and thyme before giving way to something more reminiscent of gingerbread, balsamic vinegar and slow roast lamb. You can actually taste in the wine what you should be eating with it! Add to this armfuls of fresh raspberries, black currants and Morello cherries and the mouthful is complete. Sumptuous yet elegant with something new waiting to be discovered behind every drop. 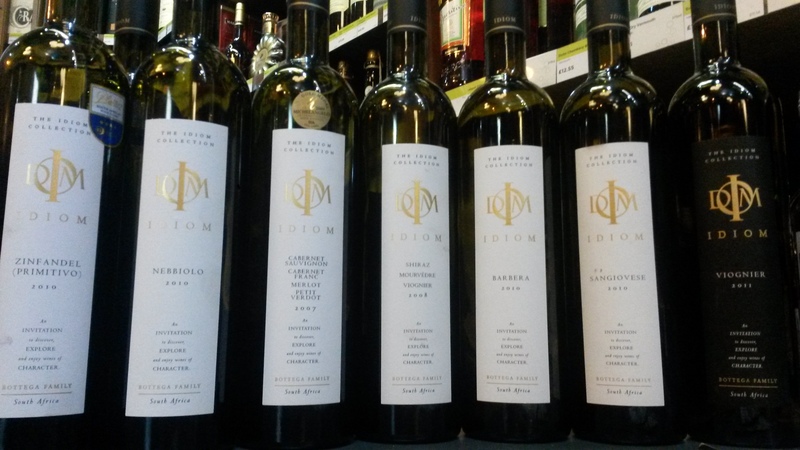 It was such a pleasure to taste the range of Idiom wines and you have the chance to as well. On Thursday 11th December Amathus Knightsbridge is hosting a comparison evening of the Idiom Italian varietals against their original counterparts. It proves to be an interesting and entertaining masterclass so book your place early to avoid disappointment. Simply email us at tastings@amathusdrinks.com to secure your place.